This Blade HQ exclusive Spyderco Yojimbo 2 is the next in line of our sold-out M4 and natural G-10 series! The Yojimbo 2 doesn't get a lot of exclusive makeup offerings, which is a shame because we love this knife! Our limited satin bladed run sold out in a day, and we expect this version to go even quicker! 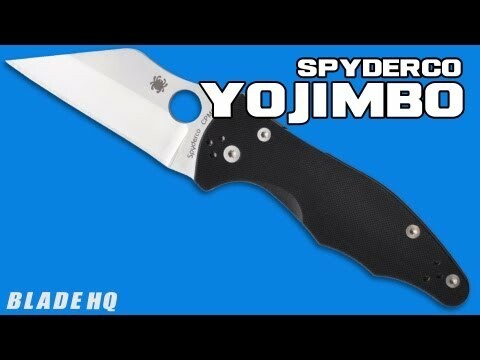 We've tweaked the standard Yojimbo 2 configuration to create a unique addition to our exclusive Spyderco lineup. The standard blade has been upgraded with premium CPM-M4 steel, a high-speed steel with excellent toughness and edge retention qualities. 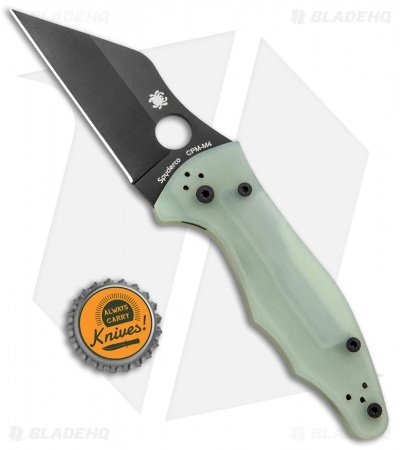 The standard handle has been replaced with translucent green natural G-10 scales. The blade, pocket clip and hardware have also been blacked out, for a striking contrast again the natural G-10. 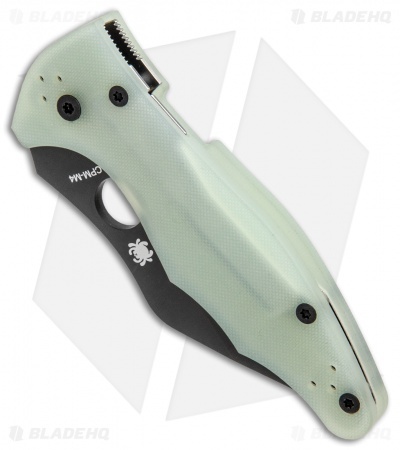 Designed by noted personal-defense trainer Michael Janich, the Yojimbo 2 is a pioneer in the application of the Wharncliffe blade. Refined ergonomics complement the natural contours of the hand, ensuring maximum surface contact and positive control. 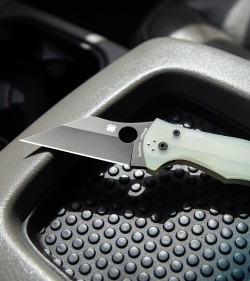 They also encourage a thumb-forward grip and make the blade a natural extension of the hand. The straight cutting edge offers extreme cutting performance by transferring power all the way to the tip and ensures improved point strength. The handle has nested stainless steel liners and a Compression Lock. Really like this edition of the yojimbo. Its got a fantastic steel selection which should be the standard version of steel for this folder. My only issue is that it was a limited run not standard production. Great job blade hq and spyderco! I am happy to say that this is my first Spyderco. 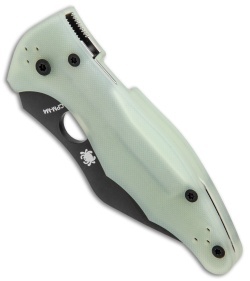 The action is amazing for spydey flicking, strong detente and a very satisfying "thunk" when the blade locks up. 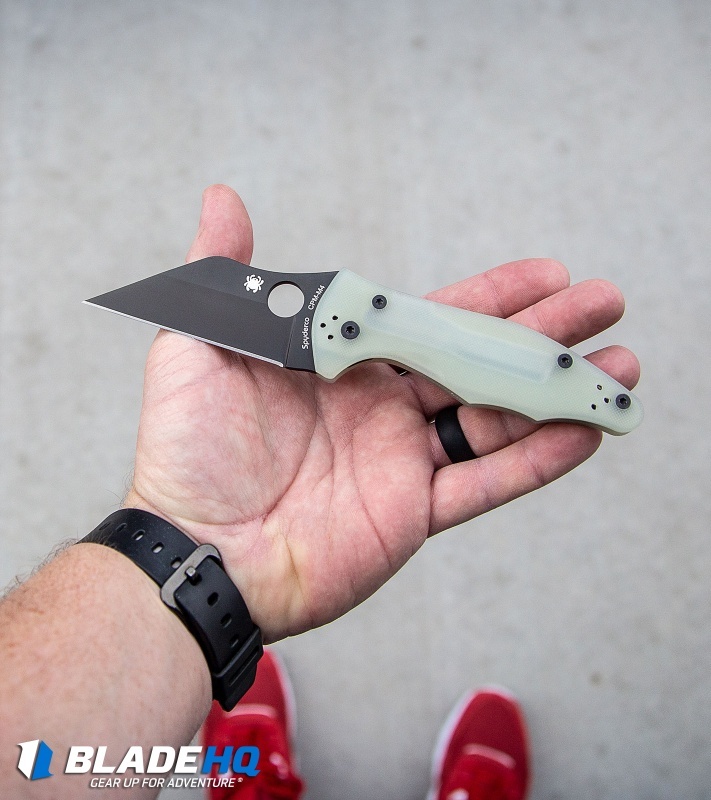 Thanks to Blade HQ for limiting 2 per customer, it only sold out in 38 Minutes! I'm also pleased with Blade HQ's great customer service. This is my first Spyderco besides the Bug, Honey bee, and the Grasshopper and I love it. I've had it for 6hr now and it's amazing hair shaving sharp out of the box and its so light. I will edit this once I have more time with it. This is my first Spyderco and M4 steel knife. The detent seemed very stiff at first and I was unable to flick it open. I applied a little lube at the pivot. It now flicks open and drops closed with very minimal effort. I love the natural G10. It's lighter than expected with the large blade. This knife has ruined me I know want a Para 3. My wonderful wife apparently listens to me and was kind enough to get me one of these knives. The thing is buttery smooth and perfect. So stupid sharp. Wonderful steel. I can’t wait to really put it through its paces. I didn’t want this to collect. It’s going to work. I’m on a farm and have some edged weapons training. 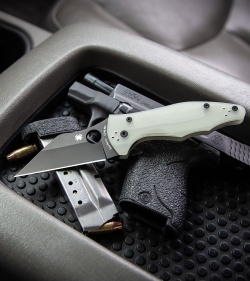 Anyone that said this is compromising EDC quality for “tactical” qualities is silly. 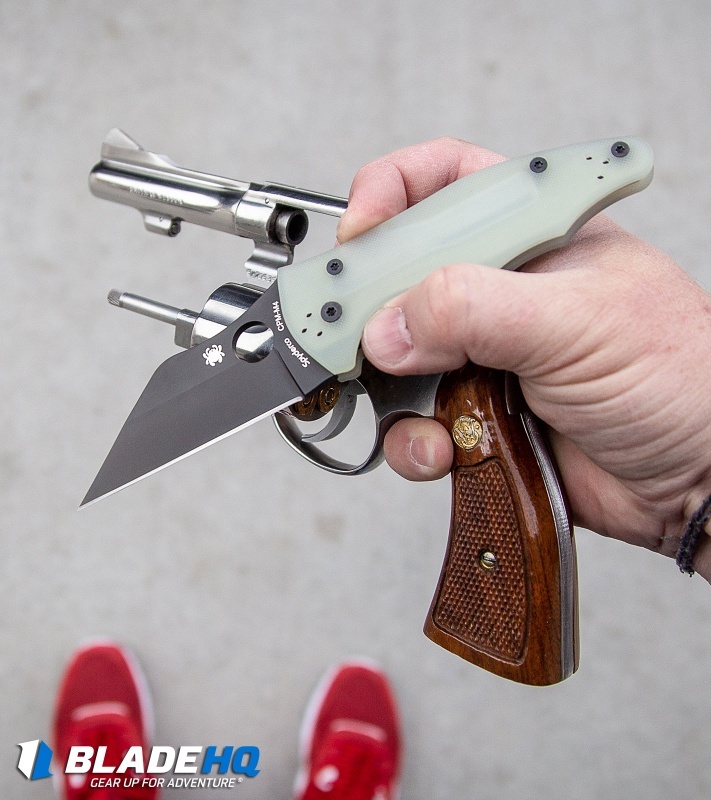 This knife fits perfectly into both roles. Guy who’s knife isn’t smooth and has play, maybe mess with your pivot a bit. Make sure your washers are in place. If you can’t tighten it enough to get the blade play out still have it give you that smooth action, send it back to Spyderco. Something is up with the washers. I can’t inagine what else it would be. I did buy a Tenacious with a flawed phosphorus bronze washer and replaced it and it was great. I want a PM 2, but wow. 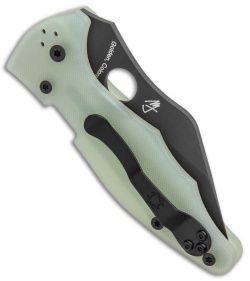 This is going to be my favorite Spyderco. I’m sure of it. Mr. Janich is a genius and the Wharrencliffe (sp?) blade has tremendous tactical application, while still being a wonderful box/package opener. Like Stephen says, came in today and it's got a good amount of side to side blade play without even applying much force, relatively stiff action but I know that will change. love the knife hate the blade play. Man this is a cool knife the action is a little stiff but i feel it might be from the coating adding a tiny bit more resistance but i think it will break in. Or I'll just take it apart and give it a tune up when i clean my other knifes. This is my third Yojimbo 2 and the only one that has both a very stiff action and some side to side blade play. I have over 20 Spyderco knives and this is a first for a Golden Colorado manufacture. I’m not thrilled with these facts but am hoping the blade wears in and becomes buttery smooth like the others. Thanks. Received this in the mail today and received a perfect example! This sucker looks so sharp!! I'm not just talking about the edge either, although it's probably sharp enough to cut your eyeballs just from looking at it!! What a slick little package.